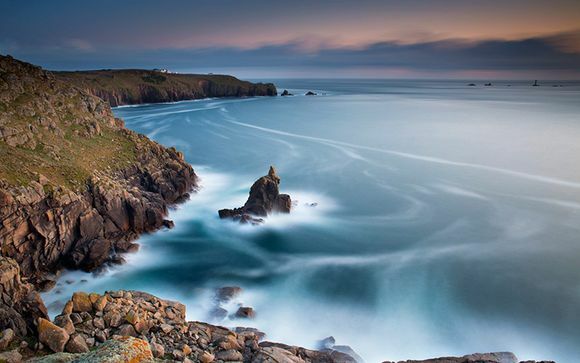 Visit one of the most idyllic spots in England - Cornwall's Land's End. Your hotel offers breathtaking views and a superb restaurant. Be sure to relax in style in your great room, and then embark on scenic walks. Only a short walk from the hotel reception and main visitor centre, where you can collect your walking guide and free heritage trail booklet, designated pathways will lead you to discover some truly breath-taking views and historical landmarks, including magnificent granite cliffs, the famous Longships Lighthouse and the Isles of Scilly (which are visible on clear and sunny days). The Land’s End Restaurant has been beautifully refurbished with a contemporary look and is a great place to relax and take in the spectacular views across the Atlantic Ocean. Choose from a range of fresh local fish and succulent steaks, or sit and relax with a drink or afternoon tea at the bar. This offer is based on a Seaview Double Room. 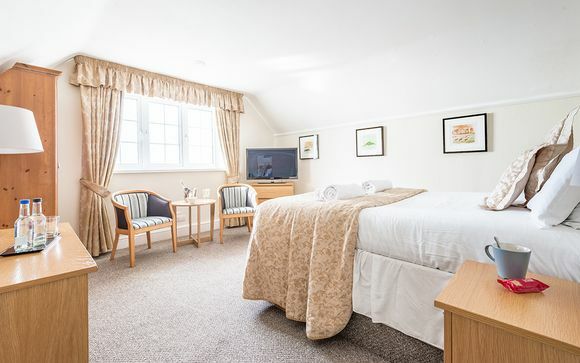 Sea view rooms offer beautiful ocean views and great facilities, providing the perfect base from which you can enjoy a superb break along the Cornwall coast. This offer is based on a bed and breakfast or dinner & bed and breakfast stay. Treat yourself and relax in contemporary surroundings whilst taking in the spectacular views – enjoy a morning coffee, a full Cornish breakfast or a homemade cream tea. There is also a lovely terrace on which to enjoy the lighter spring and summer evenings with a jug of Pimms, an indulgent cocktail or a relaxed meal from our bar menu. For the evening service, they focus on wholesome modern classics with an emphasis on Greek and Italian gastronomy, using an abundance of fresh local produce. Drive along the M4 motorway from London or the M6 motorway from Manchester, and join the M5 motorway to travel into Exeter and join the A30 to journey into Cornwall. Alternatively, if you are travelling from or via North Devon, you can opt to join the A39 from junction 27 on the M5 and travel down the north coast to join the A30 at Indian Queens. Or, if you are travelling from or via South Devon, take the A38 through Plymouth and Liskeard and join the A30 at Carminnow Cross. Once on the A30 which is mostly dual carriageway, travel westbound towards Redruth, Camborne and Hayle until you reach Penzance. In Penzance, look for signs marked Land’s End and follow the A30 for 9 miles until you reach the village of Sennen. In Sennen, travel through the village, past the road to Sennen cove and beyond the First and Last Inn and you will find Land’s End at the very end of the A30 road. From all major towns, there are rail links which run into Penzance terminating at the main station on the seafront. High speed-train services run frequently from London Paddington station including the Night Riviera Sleeper Service to Penzance. There are also direct trains daily from Bath and Bristol to Cornwall and its branch lines. The First Group co-ordinate bus services from the Penzance main station to Land’s End. Designated bus routes are the 1/1a and 1b. There is a taxi rank at the main station in Penzance and a number of local companies who will be happy to transport you to Land’s End. Newquay Cornwall Airport is a regional airport linking Cornwall to major cities across the UK as well as internationally. There are regular air links to Newquay Airport from Birmingham – (1 hr 10 mins), London (Gatwick) (1hr), Manchester (1 hr 15 mins) and the Isles of Scilly (30 mins).